Christmas Ornaments Made in USA - The Thomas Jefferson Memorial Ornament - A Christmas Ornament Co. 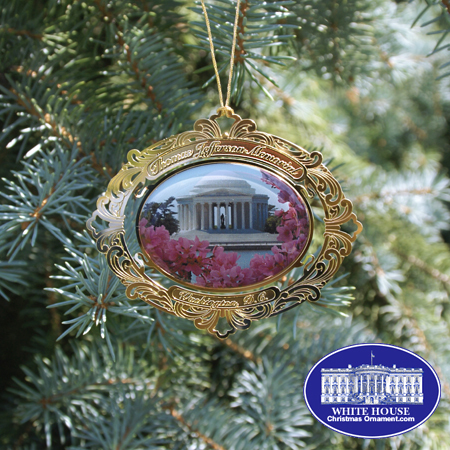 The White House Ornament Collection presents The 2007 Thomas Jefferson Memorial Ornament. The Thomas Jefferson Memorial Ornament features the Jefferson Memorial surrounded by Washington DC's famous Cherry Blossoms. The Jefferson Memorial, a circular domed building designed after the Pantheon in Rome, commemorates the contributions of Thomas Jefferson, third president and author of the Declaration of Independence.